As someone who loves both the arts and Mexican food, I have always had a soft spot for the neighborhood of Pilsen. A friend and I were visiting the National Museum of Mexican art, and wandered into a taco shop next door; it was my biggest culinary surprise in Chicago so far. 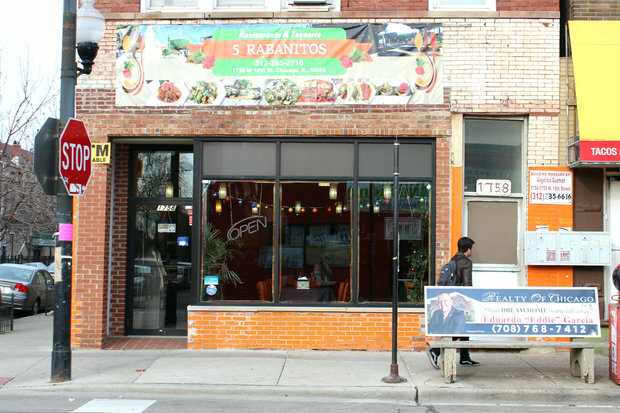 5 Rabanitos is located right next to the museum. The chef, Alfonso Sotelo, previously worked for Frontera, but he wanted to create a more authentic family style restaurant. This commitment to authenticity can be seen from the second you walk in. The place has a bright yellow, green, and blue color scheme, and is lined with artwork from local Mexican-American artists. The restaurant staff are of all ages, making it truly feel like a family business. The tables are communal and the restaurant is always loud; these are always good signs in a Mexican restaurant. I started the meal with a watermelon agua fresca. Their take on it featured enough lime that it tasted more like a delicious watermelon limeade. Next was the main attraction: the taco plate. I ordered a platter, which was $10 for three tacos, rice, beans, and guacamole. Let me tell you about this guac. It had just the right amounts of lime, salt, and pepper, while leaving the avocado to shine. I’d say it was the best guacamole I’ve had in Chicago. Though the guac was the star of the show, the beans were amazing as well. Unfortunately, the tacos were a bit more inconsistent. I had three: beef barbacoa, carne asada, and pork barbeque. The best was the beef barbeque. The meat was braised until pillowy and soft, and the fat was cut nicely by the acidity of pickled radishes. It was everything I wanted in a Mexican taco. The pork taco was very similar but less flavorful. Finally, the carne asada was lackluster. The meat was under-marinated, and lacked both the saltiness and acidity I look for in a carne asada. Additionally, the beef was very tough, making it hard to chew. The pickled radishes slightly redeemed it, but it was not a great taco. Overall, the décor was fun, the prices were good, and the sides were great. If I had only eaten the beef barbacoa taco, I would have scored it higher. Nonetheless, that one taco was one of the best I’ve had so far in Chicago, and makes this a place worth a revisit.